Even in a mild winter, Britain can be cruel to cars. Muddy roads, loose gravel and standing water can be as dangerous as snow, slush and ice – so all-wheel drive is a useful friend to have. But you don’t have to choose a big, lumbering SUV to get it. For our five-grand Friday budget there’s loads of choice – but it’s hard to beat a Subaru Impreza for all-weather capability. The high-performance WRX is Subaru’s most famous car, but it has always been possible to buy less-powerful and more sensible variants. 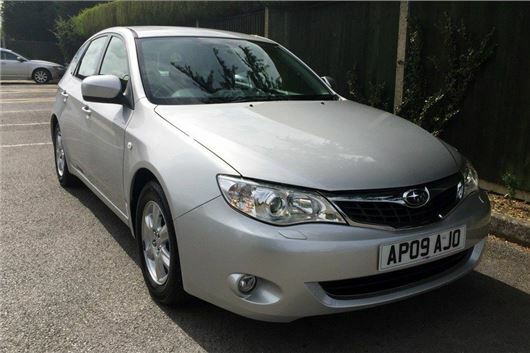 We found this 2009 Subaru Impreza 1.5-litre RX with 39,000 miles for £4990. While it isn’t the most exciting-looking car in the world, as a piece of utilitarian winter transport it’s ideal. Power comes from a 1.5-litre boxer petrol with 105PS, linked to a five-speed manual transmission with selectable low range. For mud, slushy driveways and farm tracks, low range makes all the difference, giving finer control of speed, particulary when descending slippery hills. Obviously this is no Land Rover Defender, so ground clearance limits its aptitude in proper, challenging off-road situations. But on the road an Impreza is very capable, if a little dull to drive. The suspension provides good comfort levels over potholes and bumps, plus the design of the boxer engine gives a low centre of gravity, helping to reduce body roll through corners. Then, of course, there is the all-wheel drive system to give extra traction when needed. Capable though it may be, the Impreza isn’t without its problems. The interior, while hardwearing, is pretty drab and fuel economy is only 37.7mpg officially. On the plus side Subaru tends to do well in Real MPG, so you can at least expect to see that in everyday driving. Unfortunately the 176g/km emissions mean annual tax is pricey. The car we found is at a dealer and, based on the leafy trees in the pictures, chances are it’s been with them for a few months, so a long test drive would be worthwhile to make sure everything is in order. On the plus side it might well be possible to negotiate a good discount to clear the car from stock. In terms of condition it looks very good but, as we always say in Five Grand Friday, online pictures can be deceiving. This car has done just 39,000 miles, which is very low for a 2009-registered car. Consequently the interior looks very neat and unmarked, although Subarus tend to wear well anyway, thanks to durable plastics and upholstery. Creature comforts include air conditioning, alloy wheels and electric windows – but there’s not much else to get excited about. However, if you’re looking for a solid car that’s capable in all weathers and you’re more concerned with durability than excitement it could be just the ticket.